Your cellphone is an anxiety-inducing, relationship-destroying, memory-ruining cancer box whose debilitating effects on your health and happiness you’ve already read about in a million articles instead of talking to your loved ones, your face hunched over its screen in the awkward position that will become the lasting curvature of your spine. But now Pope Francis offers another compelling reason to put it down: It’s stealing valuable bible-reading time. 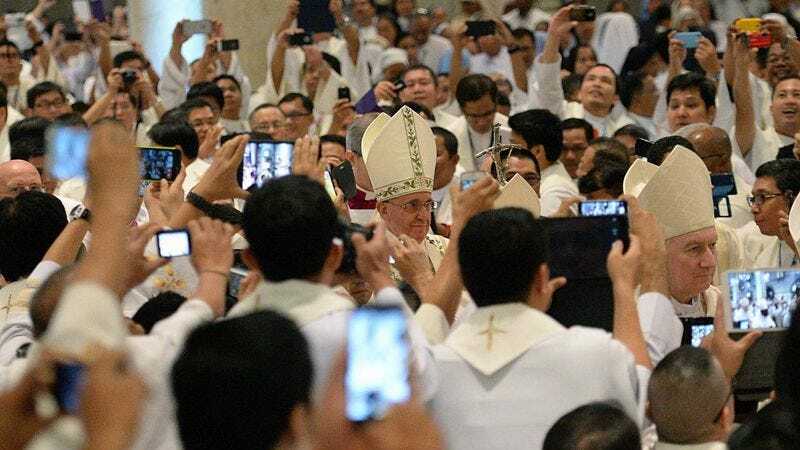 “What would happen if we turned back when we forget it, if we opened it more times a day, if we read the message of God contained in the Bible the way we read messages on our cellphones?” the pontiff asked during his weekly blessing at St. Peter’s Square while the reverent throngs below snapped blurry Instagrams. Our minds would be more peaceful. Our hearts would be fuller. Our pockets wouldn’t be able to fit as much stuff because they had bibles in them. Rather than getting into pointless arguments with unknowable strangers offering wildly subjective truths on how to live our lives, we could all just read a bunch of parables about concubines and donkey ownership written millennia ago and be all the happier. Sure, the only “friend request” you need to make is Jesus—@ him into your heart, and so forth. Still, wouldn’t you miss some of the more useful aspects of your smartphone, such as being up to date on the latest news, weather, and the like? After whipping out his bible, Francis has an answer for that too: “The Bible contains the word of God, which is always topical and effective.” And actually, at a time when every CNN push notification carries the whiff of Revelation, he has a point.